BearCub Cabin in Gatlinburg TN, is located in Smoky Mountain Village, over 3000 elevation, and is a gorgeous upscale cabin with a spectacular view of the Great Smoky Mountains National Park, OberGatlinburg Ski Resort, Mt LeConte, and the night lights of Gatlinburg. From our deck, you can see the Sky Tram ascend up the mountain as well as the skiers traverse down the mountain in winter. There are 3 levels in the cabin and you enter the center level. The 2 bedrooms in the lower level are spacious and feature a stone shower, a tv, an overhead fan and an exit door to the outside. One has a king size bed and the other has a queen size bed. The furniture is rustic Appalachian. The washer/dryer and an iron and ironing board are located near the bedrooms. The game room on the top level has a pool table, a tv, a twin bed and a full bath with a jacuzzi tub for all the guests to use. The center level comes tastefully furnished with a leather sofa and loveseat around a stone fireplace, rustic Appalachian dining furniture, and historic photos of the dedication of GSMNPark at New Found Gap, the builders of the Lodge on Mt LeConte, the Chimney Top Mountain, black bears, and the streets of downtown Gatlinburg in years gone by. The cabin is decorated with a bear theme. The center level has the living area and fireplace, dining area, kitchen and a half bath. The back deck comes equipped with a gas barbeque grill, a table and 4 chairs , a rocker, and a hot tub. The covered porch on the front of the cabin features a bench swing for you to enjoy out of the elements. Bear proof garbage cans are located beside the cabin for our guests use and convenience. There are 2 parking spaces assigned for our guests. The owners of BearCub Cabin are members of the Chalet Village Resort which gives our guests the privilege to use the Club swimming pool and tennis courts during the warm months. BearCub Cabin is close to everything this area has to offer if you have the desire to leave this wonderful cabin at all! The views are wonderful! Dollywood Theme Park, Dollywood Splash Country, OberGatlinburg Ski Resort, Gatlinburg, and the entrance to GSMNP at Sugarlands Visitors Center are all just minutes away from the cabin. With its great location, cozy atmosphere, and beautiful views, make this cabin the first step towards a truly memorable Smoky Mountain vacation! My husband and I are from Knoxville and we grew up loving this area and the Great Smoky Mountains National Park. We both are graduates from the University of Tennessee. We spent our childhoods vacationing in Gatlinburg and the GSMNPark, and we took our children there for vacations in Pigeon Forge, Gatlinburg and camping in Cades Cove and Elkmont. Our decision to purchase a cabin home in the Smoky's was an easy one! We liked the Smoky Mountain Village location because the views are unbeatable and the location is close to everything. Our family still uses the cabin for special occasions. I am an avid hiker and have hiked all the trails in the GSMNPark which totals over 840 miles. My husband is an avid runner and he frequents the Gatlinburg Trail outside of Gatlinburg which runs beside a beautiful creek. Our children use the cabin because there is so much to do and so many close attractions. We have many fond family memories from Bear Cub, it is a great home get-away. Since we are from Knoxville and grew up visiting the Smokies and Gatlinburg and Pigeon Forge, we knew we wanted a second home in the Smokies. Our property borders the National Park and it is almost on the top of a mountain...the road dead-ends a half mile from our entrance! The views are what sold us though. From our back deck we have a 180 degree vista with Mt LeConte, elevation 6593, right in the middle! We can watch skiers traverse the slopes of OberGatlinburg and the Sky Tram climb up the mountain. Bears frequent the area as well as wild turkey and deer. On the other side of Smoky Mountain Village, we can see the lights from Pigeon Forge. On clear days you can see for miles! This cabin has it all......great views out of the large picture windows on the back of the cabin and close proximity to restaurants, shops, attractions, hiking, theme parks, shows, horseback riding, skiing, golf, Cades Cove, Clingman's Dome, Space Needle, putt-putt golf, etc. Yet the cozy fireplace and comfortable interiors invite you to stay and never leave! Pets are not allowed in BearCub. No smoking please. toilet, shower, Beautiful large stone showers are in 2 of the bedrooms. toilet, jetted tub, Jacuzzi tub in the bath off of the game room. toilet, This half bath is on the main level of the cabin. 3.5 baths Each bedroom has a full bath with a very unique stone shower. The game room has a full bath with a jacuzzi. The center level has a half bath. From BearCub, you will be minutes from the main street in downtown Gatlinburg and from the back deck, you can see the night lights of Gatlinburg. My cabin is located on the edge of a mountain at approximately 3800' elevation and has a fabulous view of Mt LeConte in the Great Smoky Mountains National Park. Stacked washer/dryer near bedrooms with iron and ironing board. Stone fireplace with the ease of gas. Two reserved spaces in front of the house. Clean towels in each bathroom. Living area with stone fireplace, 1 leather sofa, 1 leather love seat, 1 leather lounge chair, huge picture windows with fantastic view, ceiling fan, flat screen tv, log walls and wood ceiling. Large Microwave over the stove top with vent unit. Large walk-in pantry with shelves and vacuum stored there. Rustic Appalachian round table which can easily seat up to 5 people. Large flat screen tv in living room, in both bedrooms downstairs and in the game room upstairs. Cable television provided. Cable tv available through Charter/ Spectrum. Several books in the various shelves in the cabin. Upstairs game room with a pool table, full bath, and twin bed. Located in the game room upstairs. A wood deck is located on the back of the cabin and the views are wonderful. OberGatlinburg is 5 minutes from BearCub and they offer ice skating, skiing, snow boarding, dining, and shopping. Tennis is available at the Chalet Village Resort. There is a public golf course in Pigeon Forge which is 20 minutes away (9.7 miles). A pool is available for my guest to use in the Chalet Village Resort. It is less than 5 minutes away. A large hot tub is on the back deck. There is so much to do in this area! You are 20 minutes from Dollywood Theme Park and Dollywood Splash Country Water Park (11.4 miles), hiking in the Great Smoky Mountains National Park, Cades Cove and Clingman's Dome, gambling in Cherokee is a little over an hour away, and all the attractions and features offered in Gatlinburg and Pigeon Forge. Bear Cub cabin was beautiful and well equipped. There were a few things I noticed that should be corrected... The air exchange cover between the 2 bedrooms downstairs was not tightened correctly, leaving one end unsecured, I also noticed a few boards on the steps coming from the top level had a little bit of give to them. The chair in the living room had a pillow on the seat and when we looked under the pillow the seat was coming apart. There was also a corner on the coffee table that was missing part of the tile and the other end was loose. None of these things interfered with our stay and like I said it was a beautiful cabin and had everything anybody would need to enjoy a vacation. The only reason I gave it 4 stars instead of 5 was the roads going up and down the mountain were scary to say the least, but that has nothing to do with the cabin itself, the cabin was 5 stars!! Thank You for sharing your cabin. My wife and I stayed in this cabin last year and enjoyed it so much, we stayed there again this year. The view is spectacular and the cabin is very well maintained and very nice to come back to after a long day. Location is also a huge plus with Gatlinburg only 10 minutes away. If it's available during our next trip to Gatlinburg, you'll know where to find us. Bear Cub is a beautiful home with a great view of The mountains. Beautifully furnished and warm, cozy decor. Sparkling clean with many amenities. Would definitely rent again. Thank you so much! I hope you will return to Bear Cub again. We had a wonderful time exploring Gatlinburg and this cabin was the perfect place to start and end each day. Beautiful views and the pictures do not do justice to how nice it is inside. Looking forward to staying here again. Everything was exactly as promised. Such a lovely place to stay for our family. Who knew my kids would become so good at pool in 3 days! Thank you for choosing BearCub! Come back at any time! Great place to stay. Fantastic view. Thank you Bobby! Please come again. Dollywood Theme Park is 20 minutes from the cabin (11.4 miles). Dollywood Splash Country Waterpark is 20 minutes from the cabin. Downtown Gatlinburg is 7 minutes away and is full of shops, restaurants, theaters, amusements, crafts, candy kitchens, Space Needle, Sky Tram, any so much more. 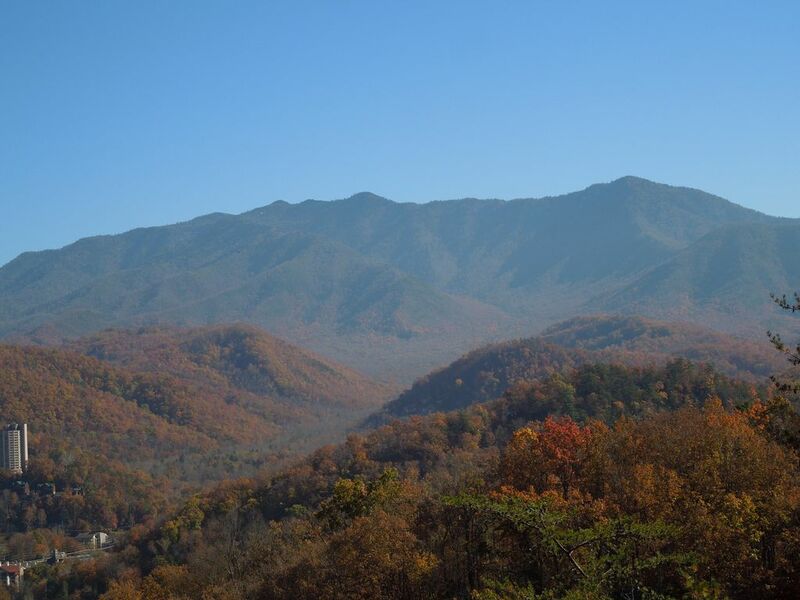 The entrance to The Great Smoky Mountains National Park is 10 minutes away. There is hiking, white water rafting, wildlife viewing, and horseback riding, Cades Cove and Clingman's Dome are very close by. Pets are not allowed in BearCub. No smoking please. Rates are subject to change until you have made your booking. I'm sorry but pets are not allowed in BearCub.